Welcome Nancy and Koda! We are always happy to have new people. There are a whole bunch of cream puppies online lately so you should have lots of people to discuss all kinds of issues with! Ask all the questions you can think of... there are lots of experts on here (don't count me as one!) 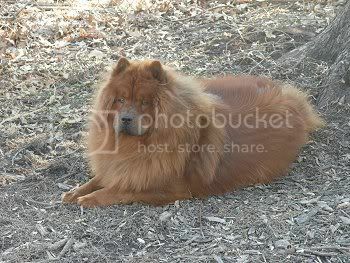 I have 2 chows and have only been a chow owner for a year but I have learned so much. Welcome to the site and as Mandy said there are quite a few chowlings on the site at the moment. They are all beautiful as are all the chows on the site. It is interesting to read about them and to see that each one is individual but how lots of things they do are the same and not like other dogs. Ihave two cinnamon girls, Milly and Mabel who were five in September. They are litter sisters. They are our first chows and we absolutely adore them. I hope your day is nice but don't worry too much. Just keep an eye on him and don't let him get overwhelmed. Just go by gut instinct and I am sure all will be well. Well we are back. We decided to leave Koda at home with my 17 year old daughter's 4 month old mixed breed pup and now I'm glad we did. As bad as I hated leaving him, there were just way too many people at my other daughter's house and I really think Koda would have been too overwhelmed. I don't want his first experience traveling in the car to go visiting overwelming like that, so now I'm glad we opted to leave him at home. I just don't believe he would have tolerated today well at all. Even I was ready to head home when I did. LOL Being left home alone with Sam (the 4 month old mixed breed) didn't seem to bother Koda too much, so I'm glad about that. Tomorrow is clean house and do laundry day, so it will be a day spent home with Koda and working on leash training which Koda absolutely detests. If anyone has any ideas to make teaching Koda how to walk and go potty on the leash, I would really appreciate it because he sure puts up a fight. My Chowling is nearly 6 months old. Her very first car ride was from northern Indiana to west michigan, about a 2 and a half hour drive. She had never heard a radio either, and she gave a peculiar look at the dashboard where the sound was coming out...nothing more endearing than the little head cocking they do! She rides in the car at every opportunity now, as does our chow/lab mix who is 9. She loves to stand on the armrest from the back seat, and has an excellant view out the front window. She also uses the front seats to keep her balanced at her shoulders when I take corners a bit sharply (read, on two wheels). I don't think she is fond of men either, as she is always growling at my husband when he first gets up, or if he gets up in the middle of the night to get water. She wags her tail at him though, and seems to like him in general, though she avoids letting him pet her. They have a very odd relationship. When she was 4 months old I took her to an outdoor party at my brother's...about a hundred people or less dispersed over a pretty large area, though we were seated while eating, and later sat around a bonfire. I was very proud of her. She is a joy to have in our home.